In construction? Here’s how to build the right app for your business. Web and application technology play a key role in just about every sector right now, and the construction industry has done a great job of embracing and exploiting software over the years, moving faster than many others. However, in many cases, organisations are wanting to save money, innovate and run leaner, and buy commissioning web/cloud platforms specific to their needs; a move away from feature-heavy desktop programs with a poor user experience. 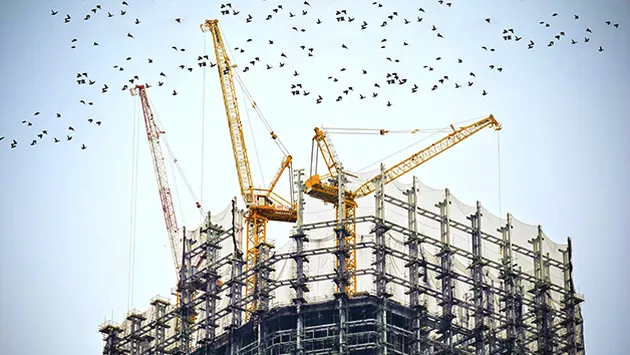 Whether it be for project management, asset management, compliance or any other core process, here are some key areas for consideration, pertinent to the construction industry, based on our experience. What type of app will work for you? Typically, when we talk about browser based enterprise applications, we’re dealing with software that runs on a laptop or desktop, in something like Chrome, Firefox, Safari or IE. However, you may also have a pressing need to service or prioritise the needs of mobile and tablet users. In which case, what type of app do you need? A native mobile app might be the best choice for something that’s exclusively intended for a mobile user-base. Conversely, a responsive app simply uses some careful styling to get the application to adapt dynamically, based on the size and resolution of the device screen. Alternatively, a hybrid app can mimic the user experience of a native mobile app, while negating the need for dedicated iOS or Android development (and any resourcing and maintenance overhead that that may bring). As in any regulated industry, compliance is key in construction. When it comes to application design and development, it needs to be designed in from the outset. Ways to support compliance can manifest in several ways, including building a checklist-driven process, strong workflow routing, perhaps with conditional decision making, comprehensive audit trails, and robust security. For any given project or process, you should be able to trace back over the journey and understand the steps taken to reach a particular point. The architectural and strategic decisions applicable to app development in construction might differ from other sectors. For example, can you guarantee that users of an app will always have access to wifi or a usable cellular service, while on site? If not, then you might need to consider offline access, local storage and data syncing. This could apply to something such as an onsite safety checklist app that site managers need to be able to use – connection or no connection – which then syncs when back on wifi. Construction plans, maps, architectural drawings…these can be big files, perhaps in proprietary or less-common file formats than the mainstream. Your application will need to be able to handle this. File storage should be secure, the process of uploading and accessing files should be quick and, for many users, being able to easily preview things like CAD files, without having to fire-up a clunky desktop program, would be a real boon. We, of course, love all of our work, but this is kind of the fun stuff! We can build in all manner of visual features, including detailed mapping, support for 360° camerawork, embedded 3D model viewers and high-quality video management (upload, processing and streaming). There are undoubtedly many other things to consider when putting together an application development project. Not least security, user experience, accessibility, robust hosting and the project management itself. However, with our construction hats on, this seems like a pretty cogitation-worthy top five list.